Finance Costs > How Much Does Coinstar Cost? How Much Does Coinstar Cost? A Coinstar machine can be used to count your spare change. With almost 20,000 Coinstar centers in the country, a Coinstar machine can easily be found in supermarkets and drugstores such as Walmart, Publix, Kroger or Meijer. According to the official site of Coinstar, there “isn’t always” a fee for using the machine. The processing fees vary on location. In the United States, 11.9% of the total amount will be charged. So that’s $9.80 for every $100 you cash in. In Canada, an 11.9% processing fee is charged while 8.9% processing fee is charged in the United Kingdom. It is also stated on the official site of Coinstar that select regions in the US offer free coin counting if you convert your change to a nationally-branded gift card or eCertificate. This is a result of some retailers and financial institutions subsidizing the fee needed for the transaction. At the time of this writing, some retailers include Amazon.com, AMC Theaters, Applebee’s, Best Buy, Nike, GameStop, Lowe’s and more. To qualify, however, there will be a minimum and maximum amount, which usually starts at $5 and caps out at $500. This will depend on the retailer. 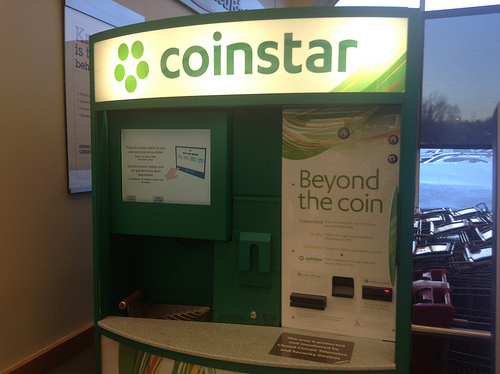 The most popular service that a Coinstar machine offers is simply turning change into cash. While you pour your change into the machine, it will count your total and no preparation work is done on your part. Once finished, a receipt will be printed out, and you can take this receipt to the cashier or customer service representative to cash it in. You can also use the receipt like a coupon while shopping at the store, and the amount will be taken off your total. This receipt must be used in the same store as the Coinstar machine. Aside from changing coins to cash, a Coinstar machine can make donations to many different charities. More than just being a money-changing machine, it is an avenue to support the charity of your preference. In addition, the Coinstar company partners with many of the brands people love. With this option, customers can convert coins into a card or eCertificate with no fee, getting the full value for the coins at hand. There are several Coinstar machines all over the country. If you want to look for one located in your area, you can just visit the official site of Coinstar and check out the list of Coinstar machines spread all over the country. According to Moneyistheroot.com, Coinstar has a kiosk within 5 miles of 95% of the U.S. population. The reported largest coin exchange on record was $13,084.59. The said number is even bigger than the annual revenue of some big clothing companies in the country. Coinstar exchanges $3 billion in coins every year. Coinstar has special offers that can help you actually get more for your coins. If you are looking forward to saving money, you can take advantage of these promos that Coinstar constantly offers. Not to mention that exclusive offers are always available for official members. Thus, you can avail of free membership in order to fully enjoy the exclusive offers. Remember, try to get a gift card rather than cash back. This can save you up to 10%. Instead of using a Coinstar machine, consider rolling your own change. While it may be time-consuming, you can separate the coins, roll them in the specified amounts, and turn them into your bank for cash. There are some banks that have a coin counting machine that its members can use for free. TD Bank, for example, offers this option for its customers. Check with your bank to see if they or another branch in the area has a coin counting machine.